Living in the English countryside has several disadvantages such as no Starbucks in the vicinity, few buses to the nearest town (which is not really a town, but, shhhh, don’t tell the locals! ), no cinema, no book store, no supermarket, etc. But there are also advantages: miles and miles of beautiful countryside, clear air, less populated, less polluted, and being in close communion with nature, which includes having pheasants stray into your garden, having wild ducklings visit your garden, a glass snake slowly sneaking through the conservatory door, swarms of insects invading your kitchen when combined harvesters plough through the fields. The countryside can also be brutal- you realise that the innocent and cuddly lambs grazing on the fields are destined for the slaughterhouse and then would be neatly packaged for the shelves in Sainsbury’s or Tescos. You see dead pheasants, foxes, rabbits, pigeons, doves, cats, and badgers on the road – unsuspecting causalities that have strayed into the country roads that have 60 mph speed limit. A couple of Saturdays ago, being one of the rare sunny days in the part of Britain where we live, we decided to play tennis in our village tennis court. Now the net is secured in a huge wooden box with a padlock. As we were unfurling the net, we noticed an 8 cm long brightly coloured reptile-like thing. The reason, I say ‘thing’ is because it was immobile and it looked so unreal that at first glance we mistook it for a prank by one of the children. Surely a rubber toy, we thought. A close inspection proved to tell a different story. 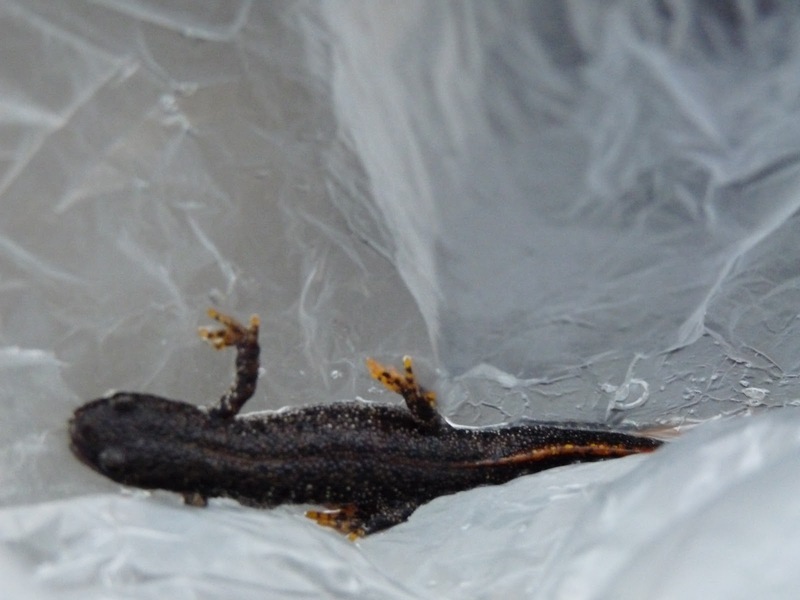 It was a newt, an amphibian, barely alive, but surely not dead. Somehow the poor creature had made its way to the padlocked net box, which had a crack at the top, and had got entangled inside the net once it was there. We gently transferred the newt to small plastic bag we luckily had with us and sprinkled some water from our water bottle. Within minutes the amphibian became alert. Now the question remained as to where to leave it. A quick pow-wow led us to two options: i. we could just release it on the grass or ii. 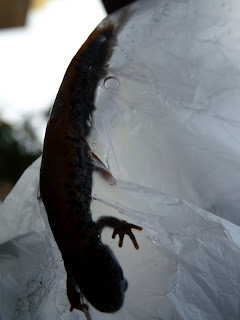 take it to one of the ponds about 4 km away in one of the country estates where we had seen newts before. We opted for the latter. A quick drive and brisk walk later we came to our destination by which time, the newt was very alert. 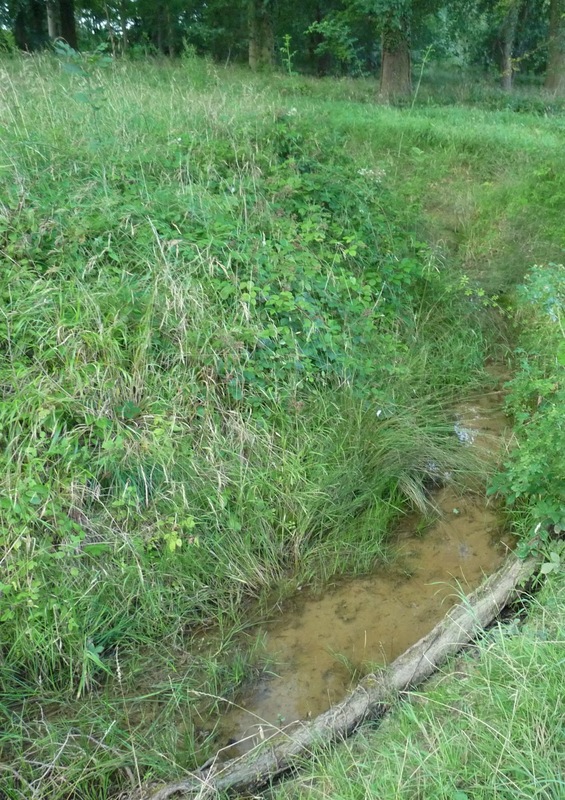 We found the ditch which had a supply of clean water and could also see several newt larvae. 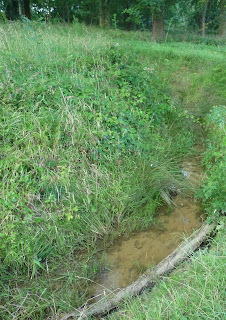 As we gently lowered the newt into the surrounding grass, it quickly darted off into the water , swimming off elegantly into the undergrowth. It had finally come home and we left, content, back to our tennis court.